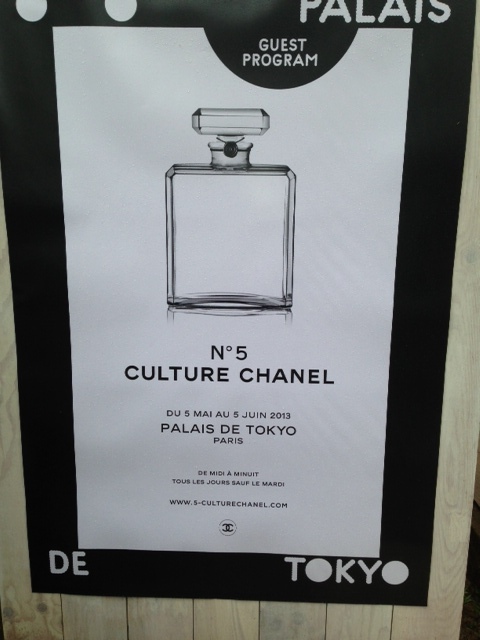 So, the real reason for our Paris visit was to attend the No5 Culture Chanel at the Palais de Tokyo. I should explain that this is a complex exhibition and you really do need some time and patience to get the most from it. I might add that I have zero concentration skills and did find it hard to get to grips with the intricacies of it. 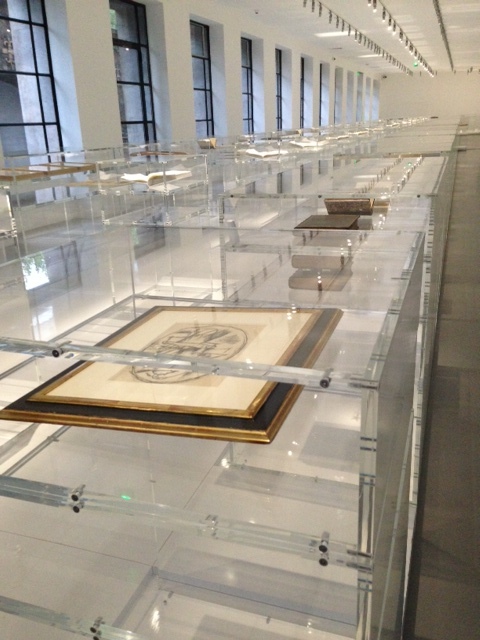 What you see here are the perspex exhibition boxes; each memento or artefact has some connection to Coco Chanel – the links are occasionally tenuous – but over all, it’s the completion of that circle that I talked about yesterday. Once you’ve seen this, you just kind of ‘get it’. We were very lucky to have an amazing guide (and translator) who wove the exhibition together like a story; otherwise you have to concentrate hard on the brochure as you have to weave from left to right through-out. I’m not going to write in great detail about the exhibition because you really do need to see it for yourself and no amount of writing can express the contents. There are so many sides to this woman. In this picture she looks angular and aloof and yet in other Man Ray portraits she is kind of, well, cute and sweet looking, with a button nose and a crinkly smile. She was a great one for keeping things of sentiment, and while she befriended many artists and musicians, she didn’t collect their works, instead keeping their letters and photos, and connecting objects, such as poetry books as a reminder. 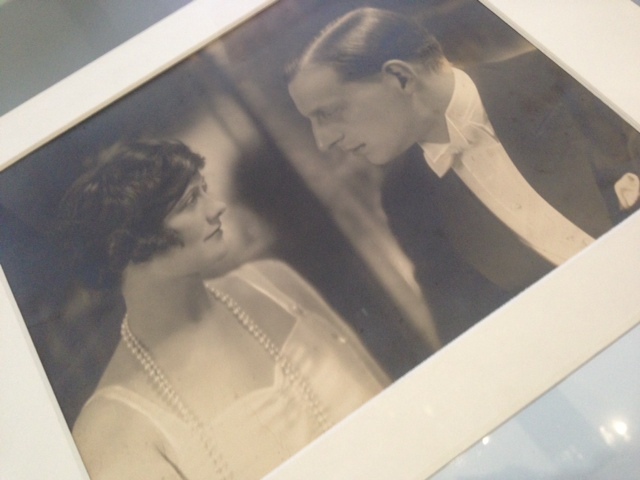 After the love of her life, Boy Capel, was killed in a car accident, Chanel fell in love with the Grand Duke Dmitri Pavolovitch. Can you see what I mean about her nose with a little turn up at the end? To me this was one of the most powerful images – they’re so infatuated with each other. A picture like this (and some others from Man Ray) let you really look at her – see past the brand if you like, to the person behind. I felt as though I was really seeing her for the first time. 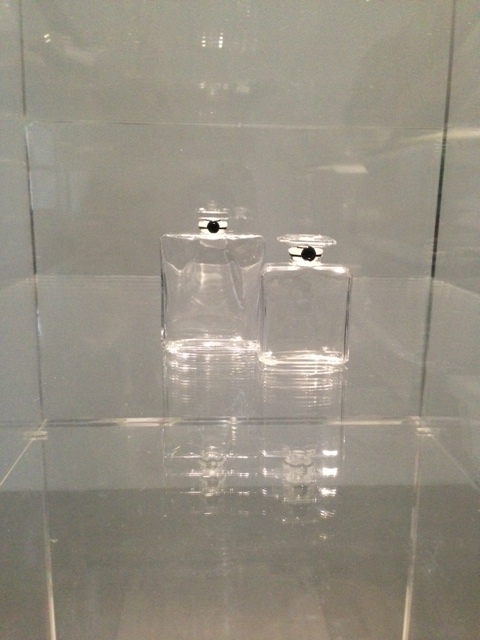 These are copies of the original shape and design of the Chanel No5 bottles. Once you exit the exhibition, there is then a huge space upstairs in the Palais de Tokyo that houses an enormous suede (faux?) sofa and more perspex display cabinets containing pressed flowers, books, and fragranced beads so you can be really interactive with it. More excitingly, the workshops! 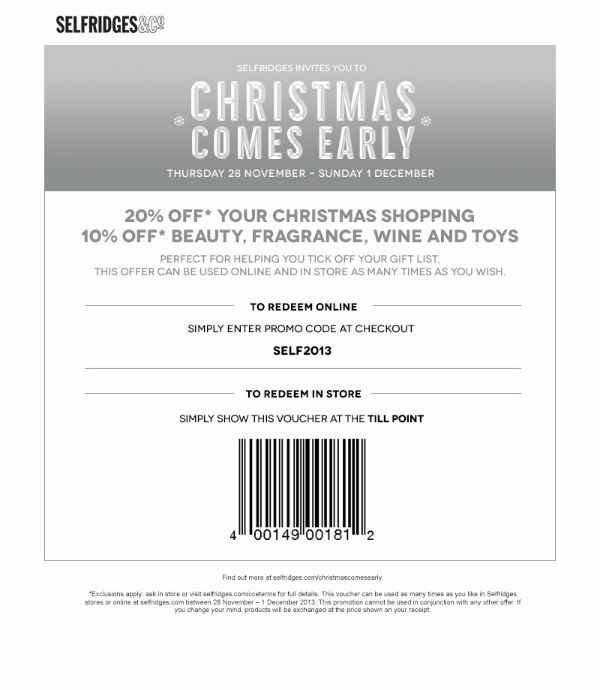 If you go, do not miss this. 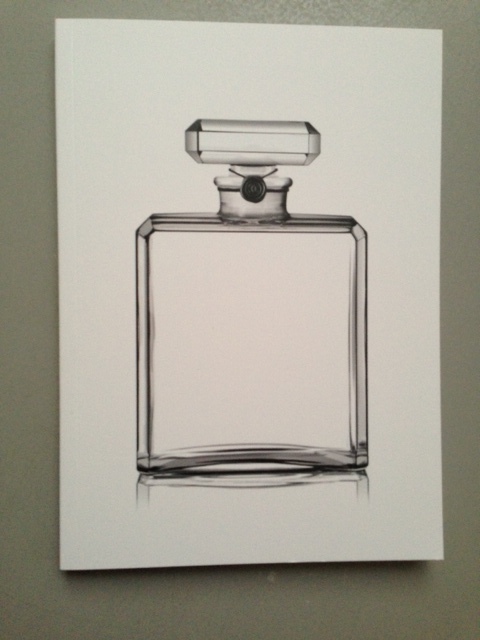 The olfactory workshop has two elements – one for adults and one for children. We got a mini-version of both. 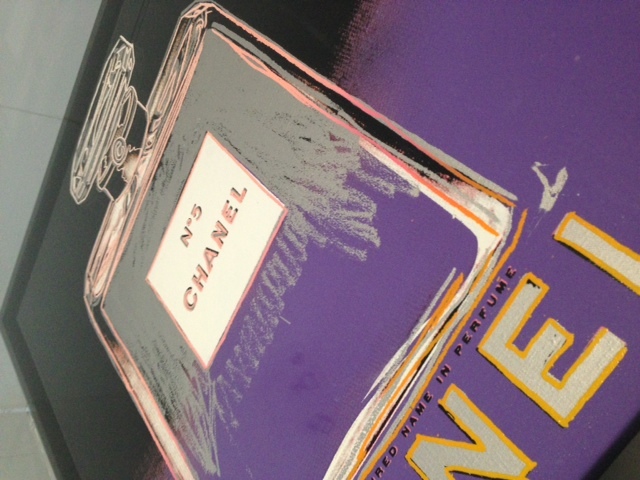 Firstly, for adults, the prominent message is that Chanel No5 was the first fragrance to make heavy use of aldehydes; two tapers are handed out so you can smell it with aldehydes and without. The difference is quite remarkable. 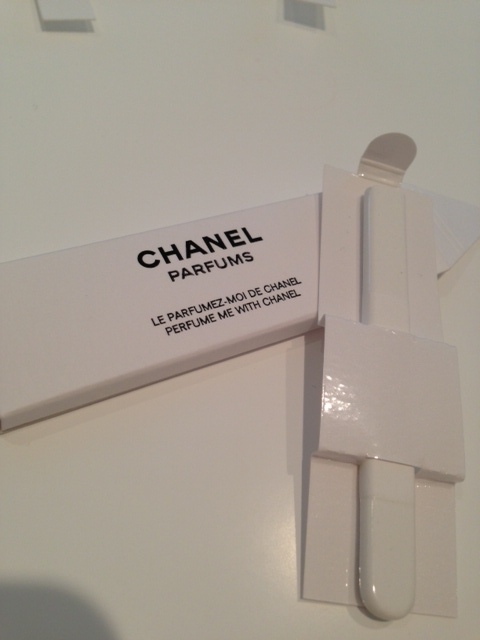 This is the Perfume Me stick – a ceramic stick that’s smooth at either end but rough in the middle. When you dip it into the fragrance, the rough part absorbs the scent. I’m pretty sure it was called something other than stick, which doesn’t seem to sum it up all that well! 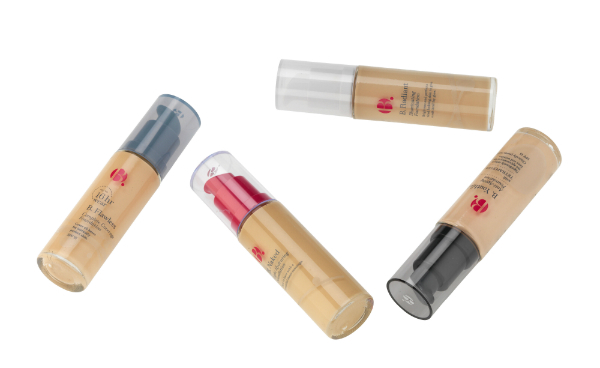 Once you’ve dipped, you pop it all back in the wrapper and use it to scent your drawers, handbag, car, wardrobe.. just whatever you would like to have a waft of No5. 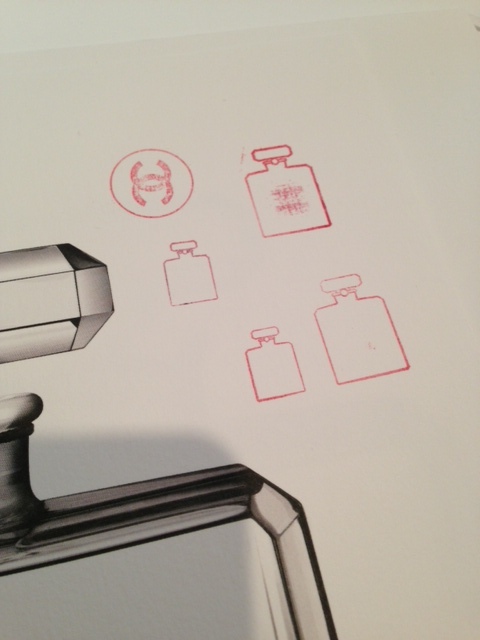 The children’s element is that you get to colour in a picture of a bottle of Chanel No5. Here’s Ruth’s (Amodelrecommends) picture! 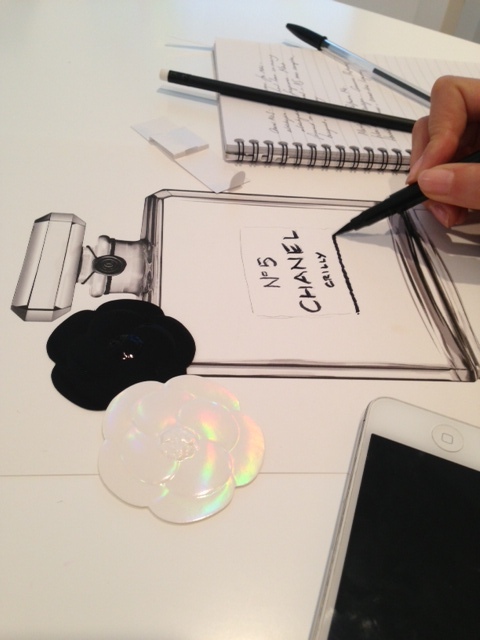 Cutting and Sticking at Chanel! I couldn’t actually bear to put too much on mine (remembering Coco Chanel’s philosophy of instead of adding, taking away). 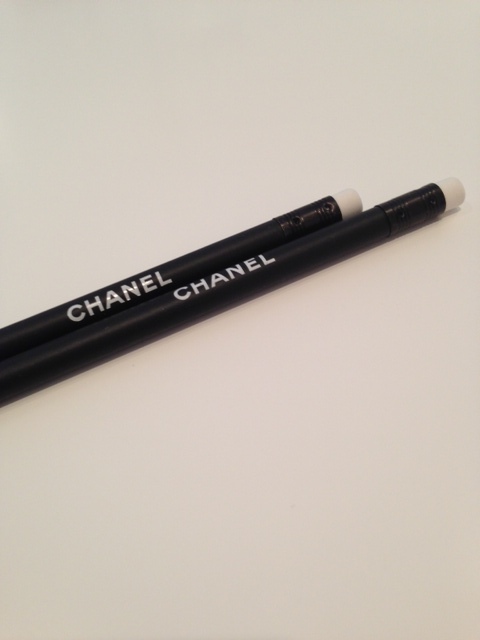 And yes, I did get a bit over-excited at Chanel pencils. 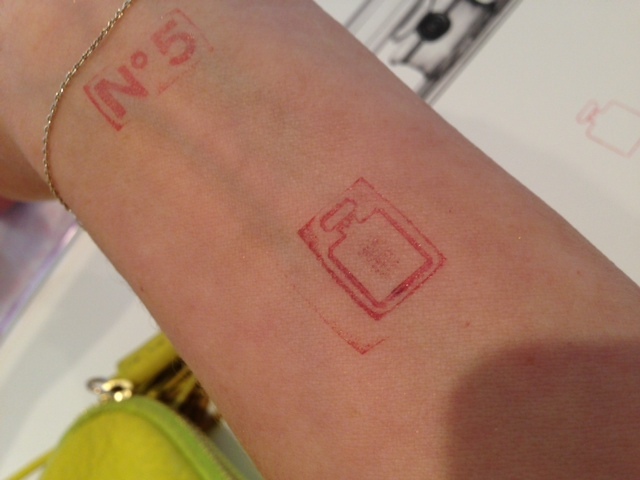 But not quite as excited as when the Chanel stamps came out..
They’re all up my arm. Practically a Chanel sleeve. I know. 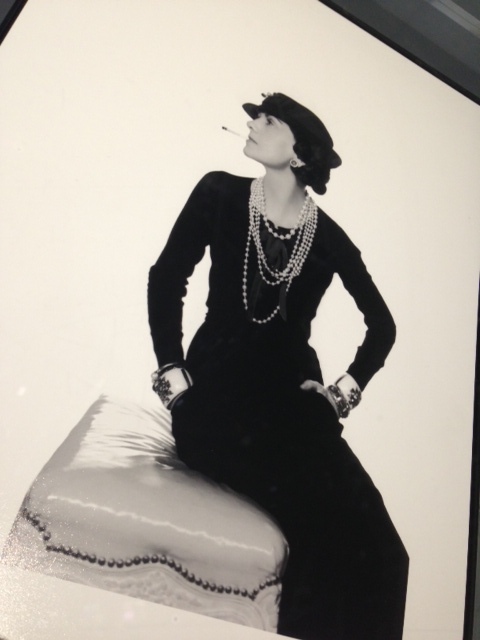 So the upshot of this is that the exhibition is very serious with fun elements – I genuinely recommend it to Chanel fans because you’ll learn more about the complexities of Gabrielle Chanel than anywhere else. You can learn more HERE. The exhibition runs from 5th May to 5th June 2013 and it’s free to see. 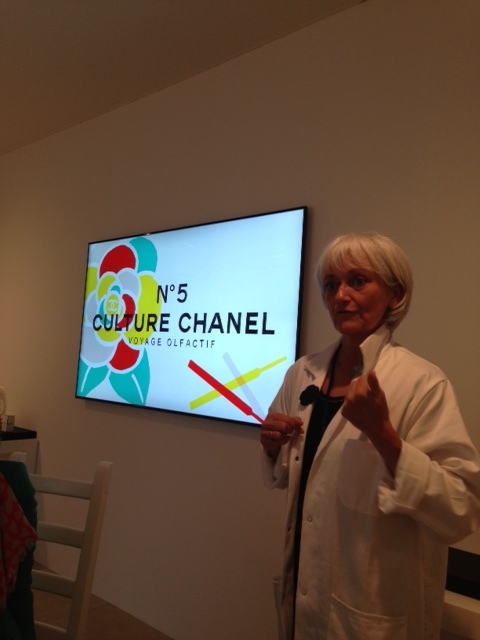 I should also mention that there is a garden in celebration of Chanel No5 – I have to admit that I didn’t get this bit at all. It was a lovely looking garden but just couldn’t see the connection really. Bloggers Are A GOOD *Thing*! This looks like a fab exhibit! Too bad I have no plans to visit Europe within the next month. 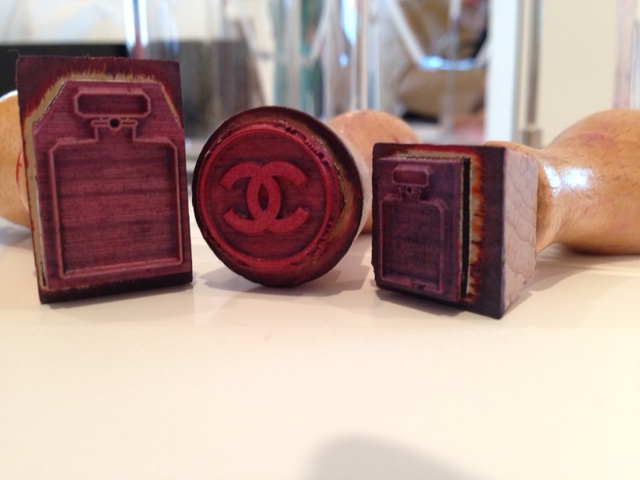 And those Chanel stamps! 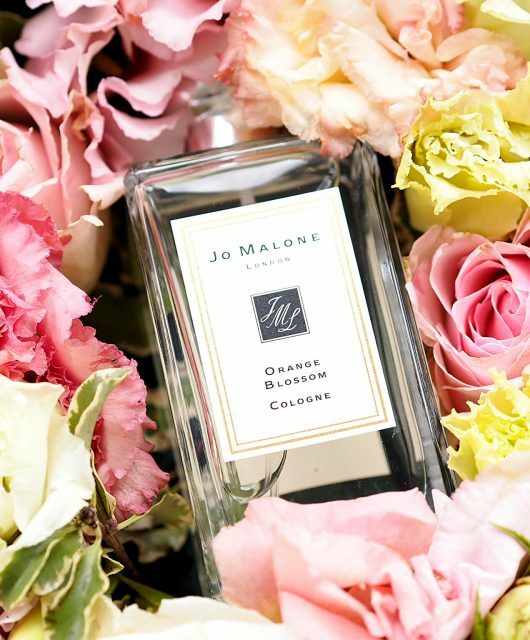 I would love something like that, delving into the history and fragrance.